This spreadsheet provides a template for planning the expenses and forecasting the revenues of a company over a 12 months period. With sales and expenses input values provided, a budget will be generated and can be used to compare with the actual revenues and expenses subsequently. The differences between the estimated values in the budget and the actual values can be calculated to help identify the discrepancies quickly and easily. A business earns profits by selling goods, products or services. This worksheet is used for forecasting sales for the next 12 months. 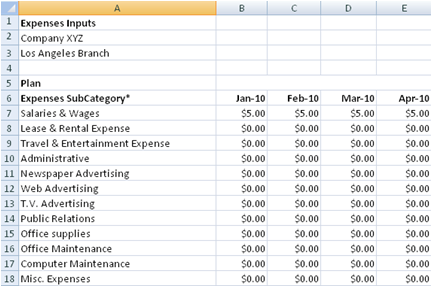 Simply enter the values for the following fields and it will be incorporated into the budget worksheets. Price* - The price of the goods, products or services. Volume* - The number of units of the goods or products sold. Cost* - The direct cost of the goods, products or services. This is the usually cost for manufacturing the product. Other than the direct costs associated with producing goods and services, other costs like salary, marketing and administrative expenses will need to be calculated to determine the profitability of the department. This worksheet allows all the selling, administrative and general costs of running a business to be entered. The expenses will then be incorporated into the budget worksheets. 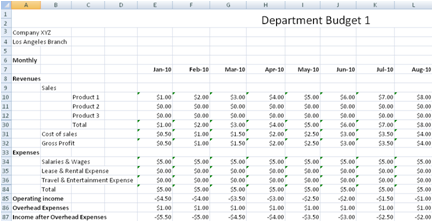 This worksheet shows the Monthly Budget of a department for the next 12 months in the first section. Basically, it shows Operating Income as Sales minus Cost of Sales and Expenses. The Overhead Expenses are deducted from the Operating Income to derive the final income. 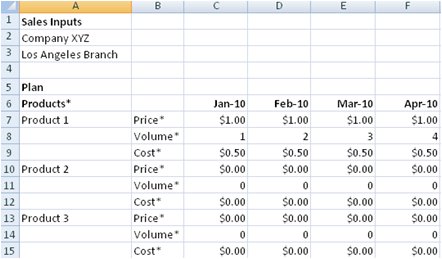 The Cumulative Budget is generated in the second section of this worksheet. The Cumulative Budget shows the cumulative total of the monthly figures. For example, the Cumulative Sales for February is the total of the Monthly Sales in January and Monthly Sales in February.